Pat Haga of Minneapolis had such good experiences on her Globe Aware trips to Romania and Cambodia that her daughter Sarah and grandson Holden of NYC were eager to join her in a three-generational group trip to Cuba. It turned out to be more of an adventure than they had expected and a real test of the resources of Globe aware and the Cuba coordinators! Here is her story. After two days of orientation and exploring in Havana with the Cuba program director Emilio, we were due to depart early in the morning via bus to our farm placement in the Valle de Vinales. My daughter Sarah, who was training for the NYC marathon, went out for an early run as usual, but startled me by returning with a pounding on the hotel door and a yell "Mom, I broke my arm!" I informed Emilio, who was waiting with a surprise birthday cake for Holden's 15th birthday, who quickly went into action. He took the three of us to an emergency clinic, started consulting with various doctors and accompanied Sarah through the facility to the various departments for Xrays, diagnostic tests, and other services. He also got in touch with Globe Aware Vice President – Volunteer Comunications, Catherine Greenberg, in the US and my husband. We were so grateful for his cheerful concern and thoroughly impressed by the Cuban medical establishment. The morning in the ER cost a mere fraction of what it would have been at home; my doctor in NYC later confirmed their expertise. After all that excitement we boarded the bus at 4 p.m. and wound our way up into a mountain valley where we were met by Yaniel and Manolo with another birthday cake for Holden, the fanciest we had ever seen, and a warm welcome. We had a late dinner and literally fell into bed. The next morning Sarah elected to rest so Holden and I climbed into Manolo's truck for the ride to the farm and their work. The farm couple, Felix and Victoria, warmly welcomed us each day with a cup of their own coffee and showed us how to do various chores like planting, trimming, and cutting manioc or yucca with a machete which was my personal favorite – Whack! Sarah had a temporary cast and sling but managed to work as well or better than her mom (who has knee problems). Holden worked rings around us. It's like the Garden of Eden there: banana, pineapple, orange and other trees, bushes, and flowers. Coffee plants smell like jasmine, everything is organic. There are no noisy tractors, only oxen and farmers working together. We were fed wonderful homegrown food and shown local sights – what a wonderful experience and great people, in the tradition of Globe Aware. Thank you, Thank you! Well, it’s happened again: a video submission from someone who wants to go on a Globe Aware adventure has won the Travelocity “Travel for Good” $5,000 grant. This time the winner is a school teacher from Hawaii. Tiffany Schivley left her job in corporate marketing to join the Teach for America program and ended up serving a community in need. It has changed her life and she is now convinced that the way to change the world is through the hearts of our children. She says her mission in life is “to serve them (children) and let them know how amazing they truly are.” She’ll have a terrific opportunity to spread that message when she encounters the beautiful hearts within the amazing children of Ho, Ghana. Good luck, Ms. Schivley, enjoy your trip! No matter how many pictures you see or personal stories you read about what it’s like to go on a volunteer vacation, nothing is better than sitting down and asking someone who’s been there. We attempted to do the next best thing by posing the relevant expectation-setting questions to our experienced volunteers via facebook posts in hopes that their answers would inform and inspire those about to take their first trip. The results were outstanding. Thanks to all those who gave their perspectives, here are reprints of some of the questions and your terrific answers. Q: What made you really anxious before going that turned out to be no problem? A: Taking my children along! A: Figuring out the local currency. A: I was worried about going by myself. But it turned out great. The other volunteers became friends and I wasn't "by myself" at all. A: I also was worried about travelling alone but the NGO I worked with in Vietnam was incredible, and it was an amazing experience. A: Language barrier not worth keeping you from going anyplace. Q: What’s something you witnessed abroad that would never happen in North America? A: Unattended four year olds selling post cards to tourists in the streets of Cusco. Also I was eating dinner in a restaurant there and happened to see a boy from the street who had befriended me and my son on an earlier trip. I invited him in to eat with me, and the restaurant manager tried to throw him out as soon as he came through the door, because he was considered "low class'. I insisted that he with me and the manager reluctantly let him stay. A: A fatal car accident just outside of Siem Reap, Cambodia, where no ambulance immediately came. No money, no medical care.... very sad. A: The transportation in India and Haiti, which would never fly in the states. A family of 4 on a scooter or a small truck filled with people hanging from everywhere. A: A grandmotherly lady waxing poetic about the state of her bowels while squatting over a trench in a park's ladies room in China. No stalls or doors, just one long trench with room for three at a time. The 15 or so people in line were very patient, modest, and those near her were friendly with her. Q: Part 1: What food/drink did you really enjoy while abroad and now miss terribly? Part 2: What food/drink from home did you miss most while abroad? A: In Cambodia - I LOVED the grilled chicken served with a mixture of salt, pepper and lime juice juice.... YUMMMY!! And, to drink, Angkor Beer. Missed food? The good ol' American style cheeseburger! A: Jicama from Costa Rica and handmade tortillas! I didn't miss any food/drink - everything was wonderful while we were there!! A: I miss bread and cheese when i am in Asia, but I love the lemon grass, coconut milk, fish dishes. A: O miss fresh palmito and all of the wonderful fresh foods. From home I miss my daily Mt Dew. Great as an appetizer while your guests wait for the main course from the back yard grill. This zesty treat features South American aji amarillo chilies, freshly grated ginger and lime, and is an ambassador to the exotic flavors of Peru. But you don't have to travel around the world to get it. Pictured is a version served up in a crispy corn tortilla cone. In the following recipe martini glasses are substituted for the snow cone cup and plantain chips can be used instead of fried tortilla chips. To make pickled red onions: Place the onions in a medium saucepan and pour in enough water to cover. Bring to a boil and remove from the heat. Strain and set the onions aside. Combine all the remaining ingredients in the saucepan. Bring to a boil, reduce to a simmer, and cook 10 minutes. Add the blanched onions and simmer an additional 10 minutes. To make Peruvian Ceviche: In a large bowl, combine fish and enough lime juice to cover. Allow to marinate for 20 minutes. Drain fish, reserving 1/4 cup of lime juice. Combine fish with remaining ingredients and reserved lime juice to taste and stir gently to combine. Chill thoroughly. Serve in a chilled martini glass, garnished with plantain chips or tortilla chips, pickled red onions and slices of avocado. 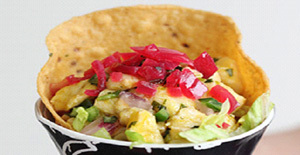 * Wild Alaska halibut is a delicious and sustainable choice for ceviche. Our very own Catherine McMillan Greenberg, whose been such a wonderful presence for us all here at Globe Aware, decided in July that she wants to turn her attention more exclusively to her children. We know she has done so much for thousands of volunteers in making their experiences abroad smoother. Please join us in wishing her well. We are happy to announce that Marla Valdivia has joined our staff, with a vast spectrum of experience from companies in water, construction and technology. Her experience in Latin American travels and work with people from varied backgrounds will be tremendous assets for our volunteers and staff alike.